The church of Our Lady Star of the Sea, Castlebay. The church of Our Lady, Star of the Sea opened on Christmas Eve 1888 when people from all around the islands gathered for Midnight Mass. The newly finished church could seat eight hundred people and we are told that on that occasion that it was filled to capacity. 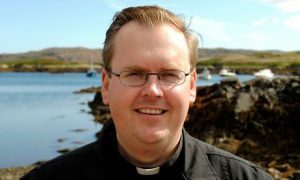 The new parish priest was Canon James Chisholm. He had been priest at St. Brendan’s church, Craigston for some years and it was he who had undertaken the building of the new church. 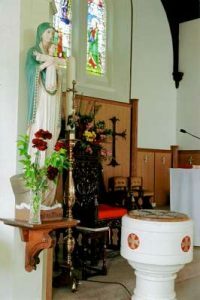 The Mass was sung by Father Angus MacDonald who was to become the parish priest of St. Brendan’s and the sermon was preached by the famous Father Allan MacDonald of Eriskay. 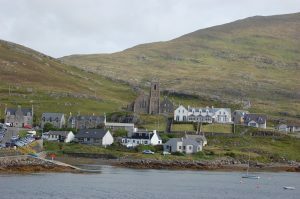 In the years prior to building the church, the population in the area had increased dramatically due to the development of Castlebay as one of the west coast of Scotland’s leading herring ports. New houses, shops, a school, a Post Office and a Bank had been built to meet the demands of those people living and working there. Up to 1888 the island’s sole Catholic Church had been St. Brendan’s at Craigston. 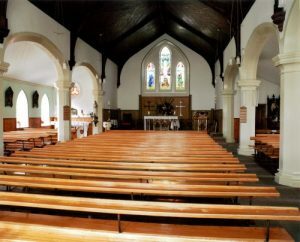 It had become increasingly apparent that a new church was required but it was difficult to obtain the necessary funding as the majority of people were poor with little money to spare. However in 1886 the Castlebay merchant, Neil MacNeil, (mac Iain Ic Aonghuis) from Berneray died and in his Will he bequeathed the sum of eight hundred pounds for the purposes of obtaining a suitable piece of ground and on it building a church. Other small monetary donations followed. small quarry be opened on his croft as the rock there was granite and was suitable for building purposes. Such a generous offer could not be refused. The architect G. Woulfe Brennan was commissioned to design the new building. The contractors chosen were MacDougall and Mac Coll of Oban. In January 1891 a bell and clock were added to the church tower – paid for by money collected locally. In March 1892 work was begun on building the Chapel House so that the priest’s residence could be at Castlebay rather than at Craigston. Article by Mary Ceit MacKinnon.